Australia, otherwise known as the ‘country down under’ is also known for its relaxing, laid-back culture. A culture where ‘chuck a sickie’ is one of the norm and where everyone is called a ‘mate’. There is no doubt that having an easy-going culture involves the mixture of alcohol on a Saturday night to unwind and appreciate the unique culture that is Australia. I mean who doesn’t love a peaceful night out in Sydney CBD? Sit back, relax and enjoy a glass of wine or cocktail to celebrate the moment with your loved one. It’s time we reveal our beloved secret, the top 5 cocktail bars that will amaze you and your loved ones for a delightful night in Sydney. The top of our list is the Blu Bar 36. We’ve started the list out strong but we’ll make sure that we also end the list even stronger. If you have never heard of this cocktail bar, you’ve heard of it here first. Blu Bar 36 offers panoramic views of Sydney Harbour on the 36th floor which features the two iconic Australian landmarks; Sydney Opera House and Sydney Harbour Bridge. Their extensive list of exceptional cocktails with a phenomenal view will leave you breathless. Watch the Sydney night light up as you and your loved one enjoy a glass of champagne. Did we mention that you can book a private luxury room to enjoy a romantic evening? At $10,000 it comes with a special cocktail with a diamond ring inside called ‘Martini On The Rock’ for the perfect wedding proposal. Alternatively, O Bar & Dining offers similar stunning views onto Sydney Harbour from above. With over 400 available artisan spirits that you can enjoy a lovely night out, you will forget everything you were stressed about. The private view area provides a very luxury and intimate atmosphere to the night. This once in a lifetime experience will be sure to impress anyone. Along with the cocktail lounge, O Bar & Dining offers private dining for a nice evening meal in Sydney CBD with a gorgeous 360 view that will be hard to find anywhere else. If you are looking for something more casual and entertaining, then we would suggest Opera Bar located next to the Opera House by the water. You will still able to take in the wonderful view of the two iconic landmarks while sipping on a cool refreshment with good company outdoor. There is daily live music at the Opera Bar that can enjoy. Whether it is a lazy Sunday lunch or a relaxing cocktail evening, Opera Bar is the perfect cocktail bar for any occasion. You will be able to witness the bustling Sydney life in the afternoon and watch the city light up in spectacular fashion late at night. With a million-dollar view right by the water edges, what more can you ask for? Its bars like these that are made for times like these. EAU DE VIE is a renowned cocktail bar hidden away in Darlinghurst. It has been voted as Australia’s best cocktail bar on a number of times and is the perfect spot for a romantic evening. 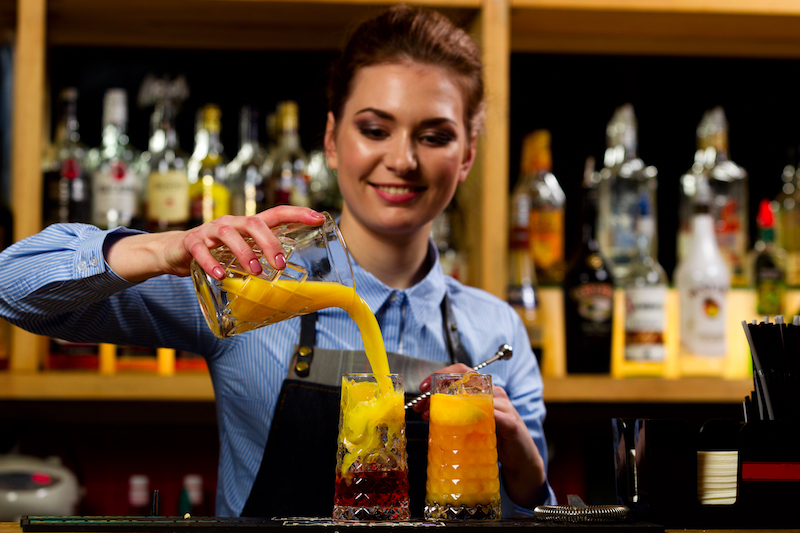 They are proud to serve over 500 of their exquisite spirits to ensure that your taste in cocktail is completely satisfied. The dimly-lit bar is both comfortable and cozy that offers a unique 1920’s feel. The interior decor comprises of leather seats, glass cabinets and moody lighting with soft jazz music playing in the background. It is the perfect place after dinner to enjoy one or two glasses of cocktail while the food settles down. To finish off the list, we had to include our favourite rooftop cocktail bar, Sky Terrace. 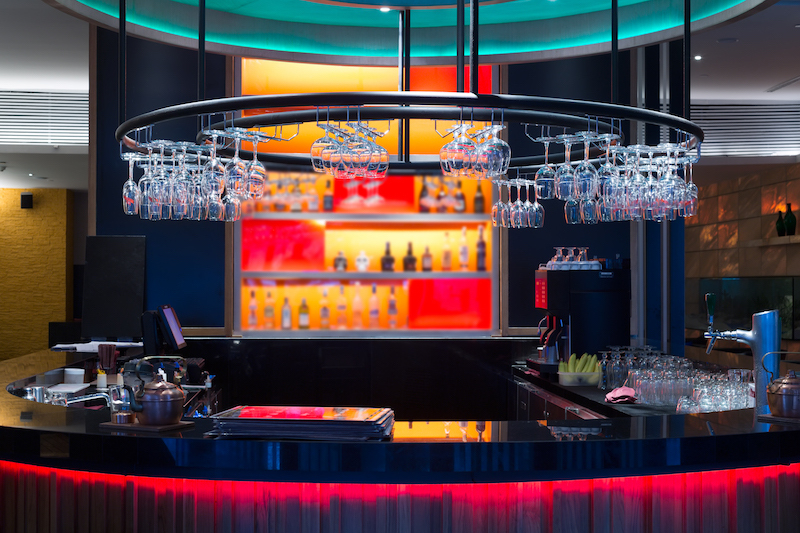 The bar is exclusively opened on Friday and the weekend and is located at Sydney’s casino, The Star. The Sky Terrace has one of the most impressive views of Sydney’s skyline and Sydney Harbour. If you think the sight during the daytime is amazing, just wait until you see it at night. The city lights up and turns to life. The open top terrace provides a respectable floor space with very modern sofas, chairs, tables and synthetic turf. There is often live music or DJ playing at Sky Terrace for an amazing vibe and atmosphere. You can enjoy the beautiful nightlife view here with your feet up, refreshing cocktail and unobstructed views of the harbour. Come for the drink, stay for the view. It’s no good knowing about these places if you can’t arrive there in style to compliment the night. Get Chauffeured can help! We offer an amazing selection of vehicles from luxury sedans, stretched limousines, minibuses, luxury coaches and helicopters to enhance the experience of a perfect night out! Let us take care of all your transportation needs and book with us!